If there’s anything that perfectly captures the inimitable spirit of the annual New Orleans Jazz and Heritage Festival, it’s the Jazz Fest poster. 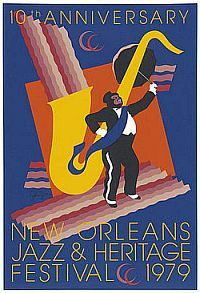 Nearly every year since 1975, a poster has been commissioned as part of the official Jazz Fest poster series. Beginning in 1998, the Festival added the Congo Square series to celebrate the Congo Square stage, which hosts Afro-centric and world music artists. Different artists are commissioned every year to do the posters (one for the Festival poster and one for the Congo Square poster). Both of the series have enjoyed tremendous popularity and success among festival attendees and art collectors. 2015 will be the first year since 1998 that will not see the commissioning of a Congo Square poster. The official Jazz Fest poster will feature the late Mardi Gras Indian chief Theodore “Bo” Dollis. 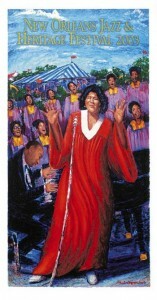 Before you pick up this year’s Jazz Fest poster, begin, enhance, or fill-in your own collection with Barnett Fine Art. Barnett Fine Art has a special collection of Jazz Fest posters dating back to 1979. Most of the posters in the collection are signed by the artist. For a full list, please visit our Jazz Fest posters page. Here are a few examples from the collection. 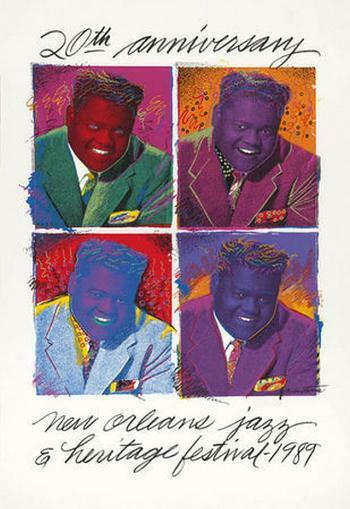 The fifth poster in the series was done by John Martinez, and saw the return of the grand marshal for the 10th anniversary of the then-young Jazz Fest. This poster uses a cut paper technique that was first used in the 1977 poster. This is one of the few posters in our collection that is unsigned. Due to high demand, this poster saw an increase in the number of unsigned editions, and still sold out before the end of the festival. This poster is edition 1,856/2,500 and is signed by the artist. Mahalia Jackson performed at the first Jazz Fest in 1970, but this is only a drop in a sea of accolades she accumulated over her celebrated career. A pioneer in 20th century gospel music, Jackson is a member of the Rock and Roll Hall of Fame, won a Lifetime Achievement Grammy, landed a gospel song in the Billboard Top 100, and sang at JFK’s inauguration and Martin Luther King’s “I Have a Dream” speech on the National Mall. This poster is signed by the artist. This entry was posted on Monday, April 13th, 2015	at 7:58 pm	and is filed under Collectable Art	. Both comments and pings are currently closed.